Order within the next 10 hours 42 minutes and your order ships today! Electronic cigarettes, along with the potential to help smokers quit, have great public health benefits. 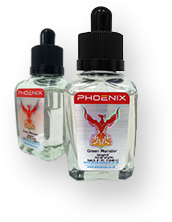 Phoenix was established with the aim to bring electronic cigarettes to the high street consumer in an open and informative environment. How do we ensure the best quality? To ensure the highest quality possible, each and every batch of our eLiquid is manufactured in the UK by fully qualified chemists and food scientists with quality levels found within the UK’s top commercial chemical laboratories. We choose to exclusively deal with premium manufacturers like Kanger and Innokin. By making sure we don’t sell clones or copies, we are able to make sure that the quality of our eLiquids is second to none. Our senior management team has a lot of technical and corporate experience; our Technical Director is an analytical chemist who has almost 20 years of experience with managing chemical laboratories at a senior management level, and our Commercial Director has managed his own businesses and worked as a consultant for a similar period. We believe in quality, customer service, and a highly technical approach to ensuring eLiquid quality and safety. All our stores are staffed by friendly, passionate and highly experienced vapers who welcome the chance to converse with new and experienced vapers about anything e-cig related- from how to stay away from cigarettes to high end Mods to legislation to e-cig lobbying campaigns. In addition to this webshop, we operate a large number of brick and mortar stores across the UK. We also have a customer service phone number which we encourage you to use for any queries or concerns- even if you didn’t purchase your e-cig from us! We are passionate about helping you to move away from cigarettes and get the very best from your e-cig experience; so please give us a call, drop us an email, or feel free to pop into your local store!